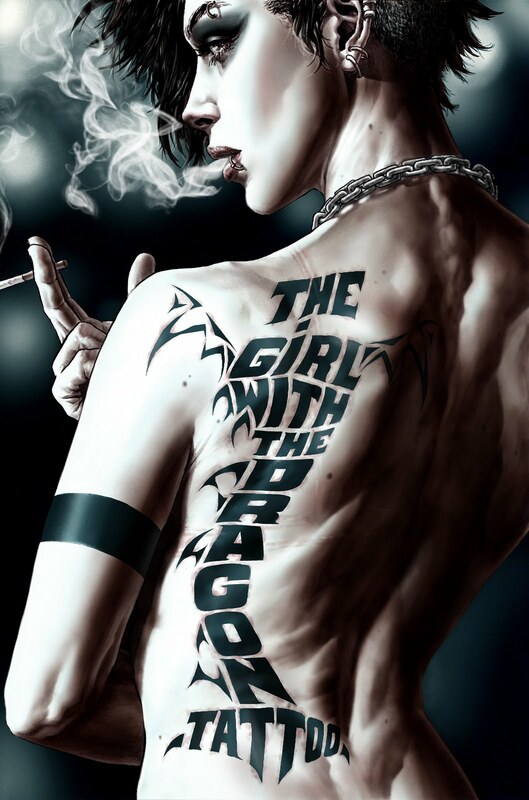 Stieg Larsson's The Girl With The Dragon Tattoo Volume 1 Hardcover comes out next week. It's the third time the novels of the same name will be adapted into a visual medium. If nothing else that should speak to the amazing popularity of the books by Swedish novelist Steig Larsson. Writers far better than I have explained why this series, and why these characters, have managed to dig such deep hooks in to much of the global reading community. Film critics have spoken at length about the impact and relative success of adapting the books into the film medium. I will leave these men and women to their own conclusions and to their own reviews. I can only speak with any kind of authority to the medium which I have devoted much if not most of the reading time of my life consuming, Comics. It's hard to start talking about the book without first addressing the book's cover. The cover by Lee Bermejo (which I feel would be somehow criminal without including a link to the full sized image so click HERE ) is a beautiful piece depicting the titular character and certainly speaks volumes about the character. I could loook at this piece forever. It's amazing. I keep finding things about it that I love (The most recent being what looks like a dragon in the smoke curling from Lisbeth's lips). Denise Mina's work from DC's Vertigo comics line as well as their Vertigo Crime Graphic Novel line showed a spectacular grasp of the medium. Her Hellblazer work in particular was really fantastic. She does a great job of adapting the work of another novelist to a new format and lets much of Larsson's original work speak through, something with which many tasked with adaptations struggle. Her collaborators on this work have a distinct difference that they bring to the work, which I think is part of what makes this work somewhat magical. First the work of Leonardo Manco. 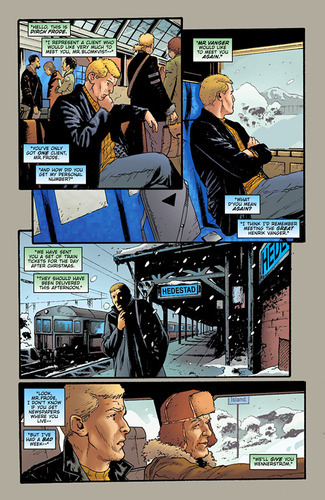 Manco and Mina have worked together before, on the issues of Hellblazer that Mina penned. So there is a familiarity to the language that they share on the page. It is clear that he grasps what she is asking of him on the page. Manco's work, which focuses on the character of Lisbeth, is brilliant. It is very lifelike and at times verges on photorealism without feeling too staged or posed. It still breathes and manages to capture the characters without making them look like celebrity portraits. There is a darkness and a grit to the pages that Manco pencils and I think that it brings the world of Lisbeth and the characters that inhabit her corner of Stockholm to stark reality. For a character who is incapable of understanding the shading of emotions it certainly makes a great deal of sense to have this kind of work depict her (It also helps to have an artist who can capture something of the kind of style that the cover depicts working on the interiors). The artist who depicts the events from the perspective of Mikael Blomkvist is Andrea Mutti. Mutti is an Italian artist who has also worked at DC's Vertigo imprint and is probably best known for his work on graphic novels like The Executor and Right State and on Brian Wood's DMZ. The difference between Mutti and Manco is instantly recognizable which is fantastic in many ways. It helps to discern the characters (all of whom are just average folks wearing average clothes) and it helps to differentiate the ways that the characters perceive the world. Mutti's pencils are a little more traditional when it comes to comics and he has a great sense for story telling that is different than the kind of page useage and pacing that Manco utilizes. Mutti's art depicts things from the perspective of a man whose world is coming apart at the seams and who is looking to find refuge from the real problems in his life where ever he can. So that it is distant from the style of Manco adds to the strangeness of the world in which Blomkvist finds himself inhabiting. Each part of the original Millennium series will be broken into multiple parts so as to give the series enough room to breathe which I think has every indication of making the comic a great series for existing fans of the novels, existing fans of the films, or even attracting a new audience all together. I can only give it the utmost of praise ... and that it makes me want to finally finish reading the novels.